Every now and then I get fixated on doing some sort of banana dessert because I love the flavor of bananas and they are always available just about everywhere. Since most of us have grown up eating bananas and they are so familiar to us, banana pastries and desserts nearly always please everyone whether it’s a cake, tea bread, pie or an ice cream dessert like the ever delicious Bananas Foster. This tart begins with a basic pate sucrée pastry dough from Dorie Greenspan. It’s crumbly and buttery and a good vehicle for everything else. 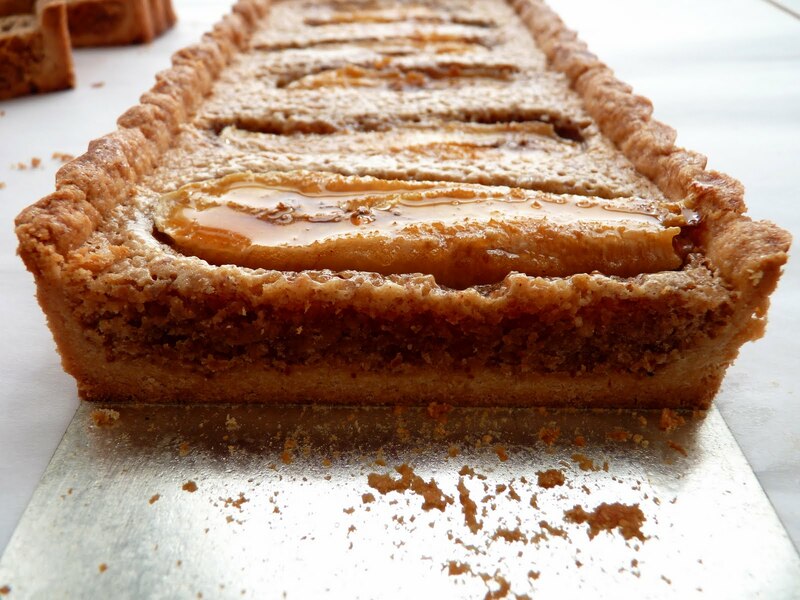 Frangipane is an almond cream that is ordinarily made by combining ground almonds, butter, sugar and egg. 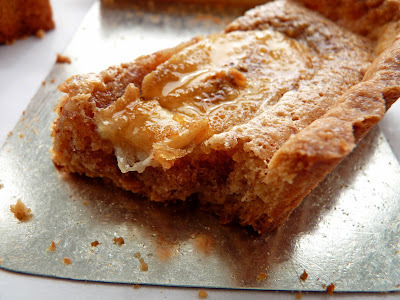 It bakes into a delicious pastry with a nutty cakey texture. I’ve perked this frangipane mixture up with great results by first browning the butter and adding a little bit of cinnamon, nutmeg, lemon zest and rum. 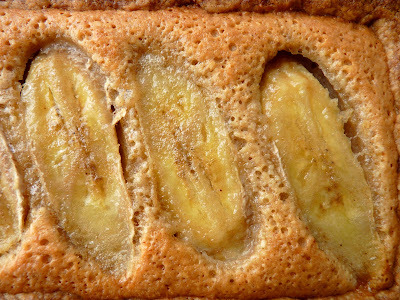 It goes well with ripe bananas that get baked into a crazy deliciousness. The finished tart is an indelible rendezvous of crispy crumbly tart shell, light and flavorful nutty filling and gooey bananas all conspiring to make it nearly impossible to have just a little bite. 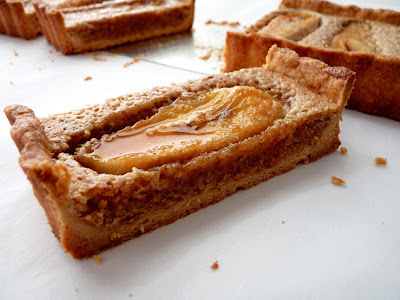 Next time you have some bananas that are at their peak, nestle them into this delicious tart. I'm betting friends and family will be grateful you did. - The recipe below is for a 9” round tart. If you’d like to make a 14” x 4” rectangle tart as shown in these photos, use the ingredient proportions noted at the end of the recipe. 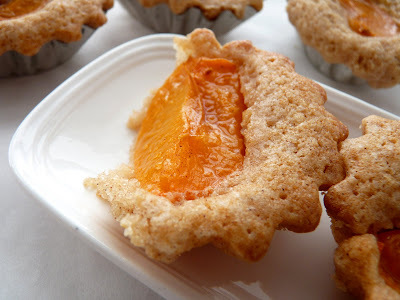 - If you prefer a sweeter filling, increase the sugar to 1/2 cup. - You can make the filling and store overnight in an airtight container in the refrigerator. - Bananas should be ripe but firm. - If you don’t like rolling out tart dough, you can press the dough into the tart pan as soon as it is mixed. Press it evenly but gently across the bottom and up the sides of the pan. Use enough pressure so that the pieces adhere but the dough still retains its crumbly texture. Place in the freezer for a couple of hours before baking. - For a good illustration of how to brown butter, see the guidance at Simply Recipes. Use a stainless steel pan so you can watch the butter carefully as it doesn't take very long to brown this small amount and can take just a moment to burn. Once you begin to detect an aroma, it’s just about ready. I lift the pan off the heat and swirl it for more control if I think it’s browning too fast or nearly done. It will continue to brown once you take it off the heat. Pour immediately into a heatproof bowl to stop the cooking. - Note that the tart shell is baked at 375 degrees and the filled tart is baked at a lower temperature of 350 degrees. Pulse the flour, sugar and salt together in the bowl of a food processor. Cut the cold butter into pieces, scatter over the dry ingredients and pulse until some of the butter looks like the size of oatmeal flakes and some the size of peas. Stir the yolk and add it, processing in long pulses of about 10 seconds until the dough begins to form clumps. Turn the dough out onto a work surface and bring it together with your hands just enough to incorporate any dry ingredients. Wrap in plastic and chill for about 2 hours. Remove the dough from refrigeration and let sit for a few minutes to warm up enough to roll out. Place the dough on a lightly floured sheet of parchment paper, plastic wrap or work surface and roll to a 12-inch round, lifting and turning dough occasionally to be sure it isn't sticking. Place the dough into a 9" tart pan with removable bottom. Tuck and fit into the pan gently, sealing any cracks that may occur. Trim overhang and form a clean border. Pierce the dough all over with a fork. Freeze the tart shell for about an hour or two. Place the tart shell on a baking sheet. Butter the shiny side of a piece of aluminum foil and press the buttered side down tightly against the tart shell. Bake for 15 – 20 minutes or until it just begins to take on some color. Remove and place on a wire cooling rack. Carefully remove the foil. If the crust has puffed up at all, press it down gently with the back of a spoon. Cool completely. For the frangipane, cut the butter into pieces and place in a pan over medium heat. Cook until the butter is a medium brown with a nutty aroma. Take off the heat, pour into a clean bowl and cool. Place the almonds, sugar, flour and salt in the bowl of a food processor. Process until the almonds are finely ground. Add the cinnamon, nutmeg and lemon zest and pulse. Add the egg and egg white and blend. Add the cooled browned butter, rum and vanilla and process until the mixture is thoroughly combined. Pour into the cooled tart shell. Cut the bananas into long diagonal slices. Place decoratively onto the frangipane. Brush the bananas lightly with butter and sprinkle them lightly with sugar. Place the tart pan on a baking sheet and bake for about 20 – 25 minutes until the frangipane is puffed up and a tester comes out clean. Cool on a wire rack. Brush the bananas with honey for a more finished presentation. For a 14” x 4” rectangular tart, use the following ingredient measures. Tart Shell: 1 C flour, 1/3 C confectioner’s sugar, heaping 1/8 t salt, 3 oz cold butter, 1 egg yolk. Frangipane: 2 oz butter, 2 oz almonds, 1/4 C sugar, 1 T + 1 t flour, heaping 1/8 t salt, heaping 1/8 t cinnamon, pinch nutmeg, zest of half lemon, 1 egg, 2 t rum, 1/4 t vanilla. I’m pretty thrilled to have apricots in my world once again! It seems like forever since I last had the pleasure of savoring their bright sunset glow. Since apricots are my favorite fruit, I usually keep it simple and go to my favorite apricot pastries and desserts, such as the incomparable Apricot Galette, the super delicious Apricot Cornmeal Crumb Tart and the incredibly sumptuous Apricot Compote that pairs with a very tender Cornmeal Cake (it’s also really good spooned over homemade vanilla bean ice cream or some incredible Noyau ice cream). Once I get those necessities and obsessions out of my system, only then can I start to think about other recipes. But today I’ve put together these very quick tea cakes, good for a morning or afternoon crowd. I’m not sure why but I’ve been craving cinnamon lately so these cakes became a vehicle to co-mingle the spicy adventure of cinnamon with the tart tang of fresh apricots. They are not fancy or fussy, just two-bite morsels of simple goodness to pass around the tea table. Here's to a fabulous season of apricots! - The cakes are a bit sweet to counterbalance the tartness of the apricots, which become even more tart and acidic when baked. - If you’re not crazy about cinnamon, use only 1/4 t or eliminate it altogether. Or substitute a pinch of nutmeg. - Depending on the size of your mini-muffin tins, you made need a second pan for a couple of additional ones. - I’m also very tempted to eliminate the cinnamon and make these cakes with a very good extra virgin olive oil instead of butter, yogurt instead of milk and the addition of some orange zest. - I use a small ice cream/cookie scooper to portion the cake batter. 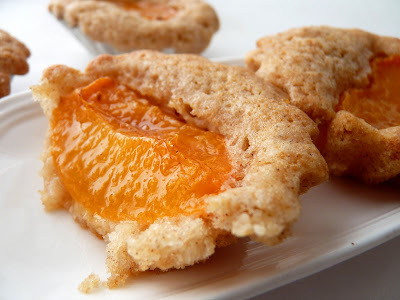 - Substitute ripe peach slices, nectarines or plums. - You might also enjoy the similar style of these Almond Buckwheat Berry Cakes. Preheat the oven to 350 degrees. Generously grease a mini-muffin pan and a couple of extra cups in a second pan (or line with papers) or 12 - 14 2” tea cake or dariole molds to be placed on a baking sheet. 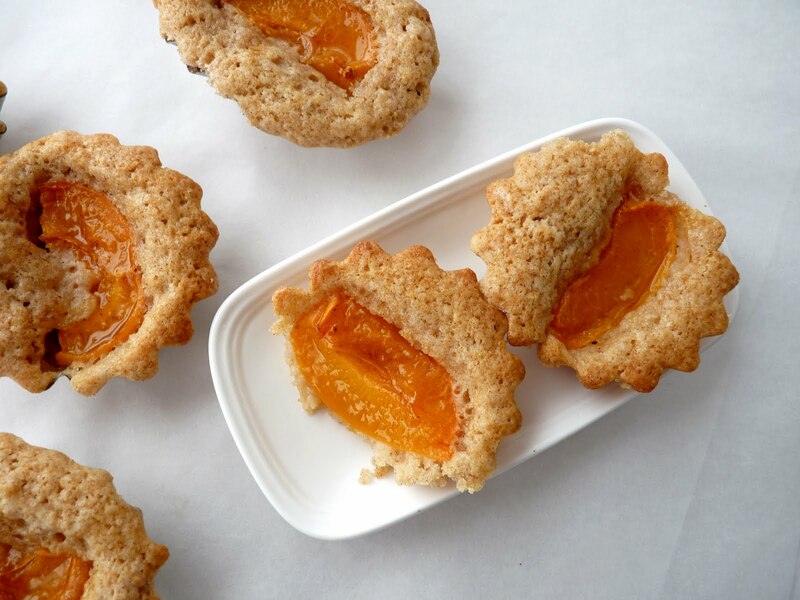 Slice the apricots into quarters and set aside. Combine the sugar and cinnamon and set aside. Beat butter and sugar until light and fluffy, about 3 - 4 minutes, scraping down the bowl to be sure you’re fully incorporating the ingredients. Add the egg and mix thoroughly until fully blended. Add the vanilla. Mix in one-third of the flour at a time alternately with one-half of the milk, beginning and ending with flour. Scoop a tablespoon of cake batter into each mini muffin cup or small mold. 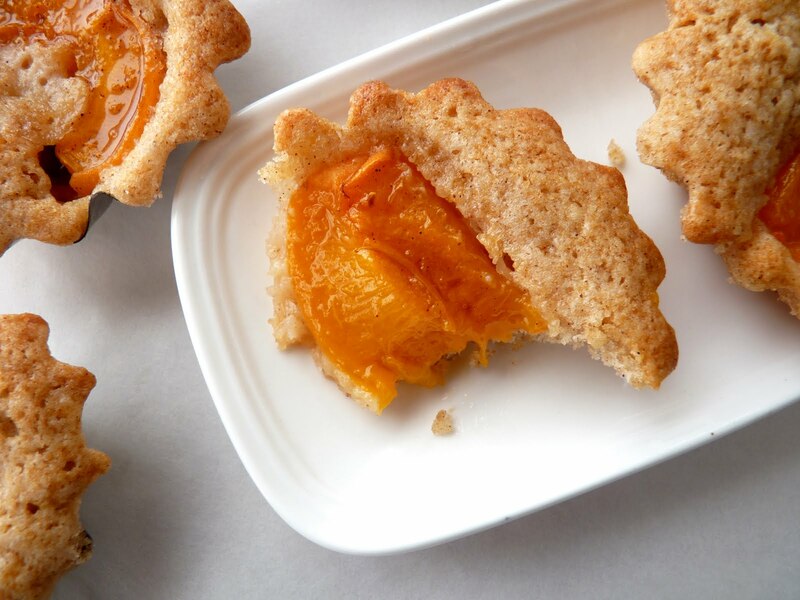 Press a slice of apricot into the batter. Sprinkle the apricots with the reserved cinnamon sugar. Bake the tea cakes for about 20 minutes or until they are slightly browned and the cake springs back when touched. Cool and remove from the pan or molds. Brush the apricots with warm honey if you prefer a more finished presentation. 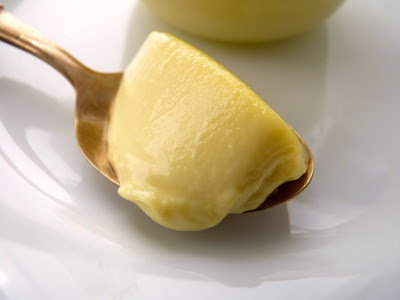 The ultimate beauty of custard is found in its simplicity – eggs, dairy, sugar, a bit of flavoring and not much else. But how you work with these ingredients makes all the difference in the world. If you’ve tried baking custard and have been less than thrilled with your results, you’ll want to try these techniques and see if you don’t fall in love with the melt-in-your-mouth texture and sublime flavor of these baked custards. 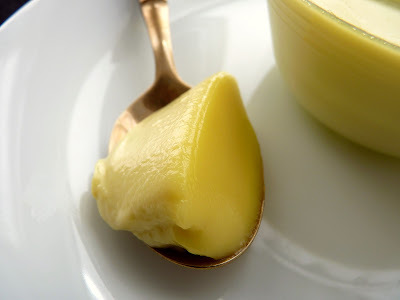 What makes custard such a desirable dessert is its velvety luxuriousness. Because one of the basic ingredients of custard is eggs, the silkiness of baked custard comes from controlling both the temperature of the mixture before it’s baked and during the baking process. Shuna Lydon is a pastry chef known for her wonderful custards and her engaging personal and work life confessionals at her blog, Eggbeater. And now, lucky for us, she illustrates her method for perfect custard in a series of very short videos she shot with Food52. Shuna delivers a few indispensable procedures that will change your custards forever. 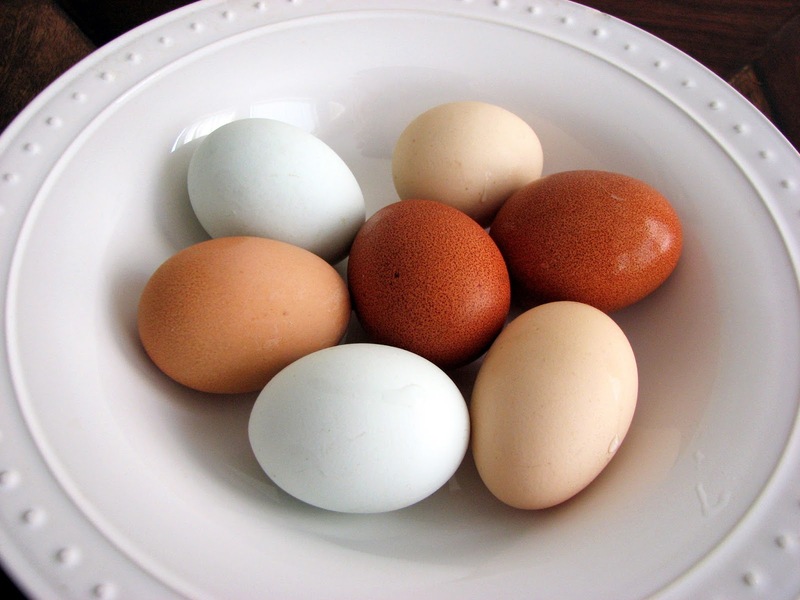 You’ll learn why eggs need gentle and delicate prodding and how best to create a terrific finished product. I urge you to watch all of these fun and very informative short clips to see how simple it can be to improve your game. The Big Reveal, part 5: Tasting the final product (1 minute, 35 seconds) and a link to Shuna’s Butterscotch Pot de Crème. So now that we’ve seen some of the techniques for producing the silkiest custard, it’s time to put it all to the test. This is my recipe for a basic but very delicious Vanilla Custard. It’s also a perfect medium for all kinds of variation. You can flavor it however you wish by infusing the cream with your favorite flavorings. My photos here are of a lime version I made by steeping the warm cream, milk and sugar mixture with lime zest. I hope these lessons and suggestions contribute to perfect custards in your future! - In addition to vanilla custard, branch out and flavor with zest of lime, lemon or orange, whole or ground spices, fresh ginger, coffee beans, tea or your favorite fresh herbs (fresh bay leaf is nice; 1 leaf per cup of liquid). For citrus, I grind the zest with the sugar in a food processor to infuse the sugar with the citrus oils, then add this to the warm cream mixture. Steep as long as it takes to get the right concentration of flavor depending on what and how much you’re steeping. Taste as you go to get the right strength. Strain before mixing with the egg yolks. - Use the freshest cream, eggs and flavorings for the best possible results. 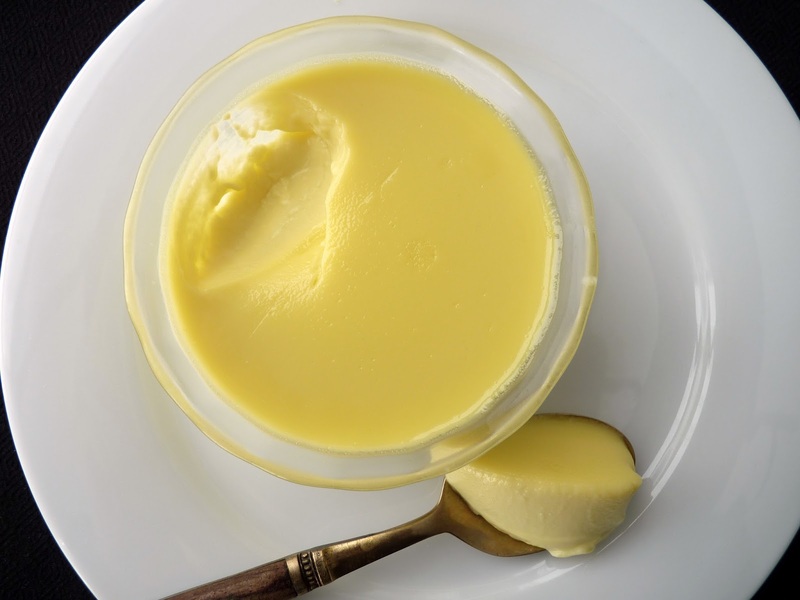 - Baking custard in a bain marie or water bath ensures slow and even baking. - My recipe has the level of cream to milk ratio that I like. Vary according to your own taste and desired level of richness. Same applies to the measurement of sugar. - I ran out of good professional plastic wrap as I was making this custard so I went with foil. Still got really luscious results. If you use foil, be VERY careful when lifting it up to check on the custards. Make sure you let the steam out in a direction away from you, wear an oven mitt or use tongs. Steam burns really do hurt. - Sometimes using a large roasting pan for a water bath can feel a little unwieldy. When I’m making a larger recipe, I use two smaller pans and fit 3 - 4 ramekins in each. This makes it a lot easier to remove from the oven without splashing water into your custards and damaging all your careful work. - Custards are best eaten the same day without refrigeration, although they will keep for a couple of days in the refrigerator as long as there aren't any strong aromas lingering from other food items. Slice open vanilla bean lengthwise and scrape the seeds into the sugar. Work the vanilla seeds into the sugar with your fingers so they are evenly distributed. Place the vanilla sugar along with vanilla pod, cream and milk in a saucepan. Bring this mixture to a slow simmer. Take off the heat and infuse for about an hour. Warm the cream mixture just until it feels warm to the touch. Do not simmer. Remove the vanilla bean pod and whisk egg yolks together. Gradually whisk warm cream into egg yolks and combine thoroughly. Whisk in salt, to taste. (Add the vanilla extract at this point, if using). Let the mixture cool completely in a bowl or container set in an ice water bath. Preheat oven to 325 degrees. Place four 4 oz ramekins or custard cups in a small roasting pan. Ladle or pour custard into ramekins or custard cups. If you have a scale, use it to be sure each dish has an equal portion. Pour enough hot water into the roasting pan so that it comes halfway up the sides of the ramekins. Tightly wrap foil or plastic wrap over the roasting pan. Carefully set in the center of the oven. Bake the custards until just set, about 35 – 40 minutes. When you tap a ramekin, the whole surface should jiggle a bit. The edges should not soufflé. Remove foil or plastic carefully, avoiding the hot escaping steam by pulling the wrap so the steam escapes away from you and your hands. Remove the ramekins from water using an oven mitt or a pair of tongs and cool on a wire rack. Serve slightly warm or at room temperature. Cherry sighting! It’s been awhile but cherries have finally arrived, their own particular bright and gorgeous signature deep red so entirely welcome right about now. After a long period of winter rituals, when cherries pop onto the scene we celebrate their beauty by shaping pies and turnovers and sundaes and that incredible pleasure from northern France, Gateau Basque, each with their own particular splendor. The first cherries I purchased this season are decidedly juicy and sweet, a good omen for the weeks ahead. This cake is light and fabulous with a just touch of cornmeal for a very slight element of texture and golden summer flavor. It has a tender texture that really goes well with fruit. The cherries are first bathed in a little sugar, balsamic and orange zest to produce some juices that will turn into pockets of rich fruit. The extra compote makes a great sauce to ladle over each slice. Stone fruit season is about to join us once again. 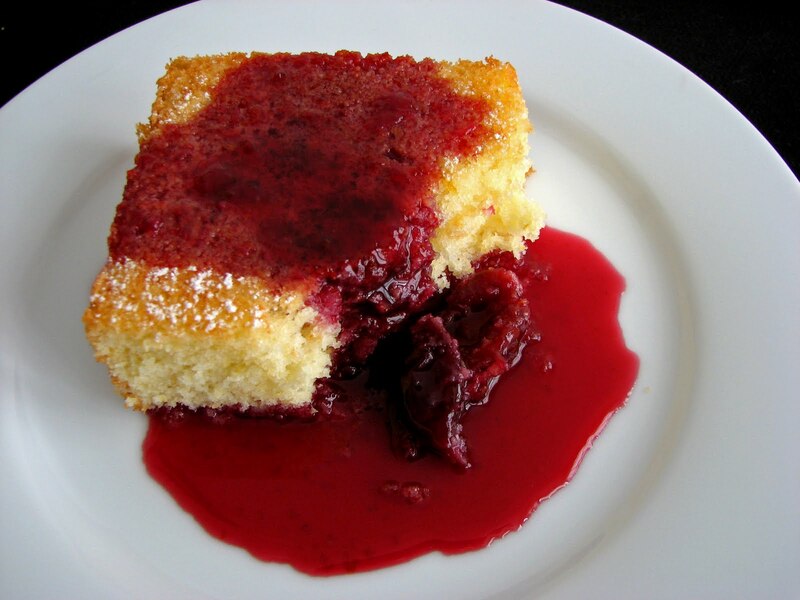 Now is the time to capture some cherry abundance with this delicious cake. 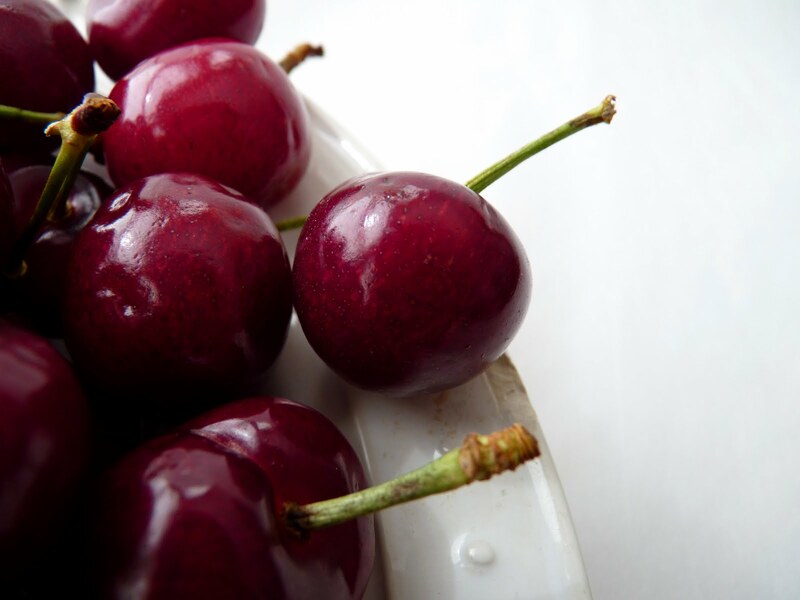 Locate some cherries, dig in and let your fingers turn a wondrous shade of red! - It’s important to have butter and eggs at room temperature for the butter and sugar to aerate properly and the fats to emulsify. One way to quickly take the chill off of eggs is to place them in a bowl of hot water for a few minutes while you gather and measure out your ingredients. - Even when using a cherry pitting tool, make sure you can account for all the pits. Sometimes you can puncture the fruit but the pit still remains inside. - The sugar level for the fruit will depend on the tartness of your cherries. Add more to taste if you desire. Same for the balsamic. - When placing small pockets of cherries into the cake batter, drain most of the juice off so the cherries are still moist but the cake batter doesn't become soupy. - I’m sure you can try this cake with lots of other fruit, which may require little or no cooking. Apricots, peaches and nectarines would lend themselves to honey and lemon rather than sugar and balsamic. Figs might benefit from a dab of port. Pit the cherries and place them into a saucepan with the sugar and the orange zest. Cook over low heat until the juices begin to flow. Add the balsamic vinegar and a tiny pinch of salt and cook for just another few minutes until the cherries are tender. Take off the heat and let cool while you prepare the cake batter. Preheat the oven to 350 degrees. Grease a 9” square pan and parchment paper, leaving a short overhang on two sides. Dust lightly with flour. Beat the butter and sugar until light and creamy, about 3 to 4 minutes. Scrape down the bowl. Add eggs one at a time and blend thoroughly. Add vanilla and citrus zest and combine. Add the sifted dry ingredients in thirds, alternating with half the sour cream, beginning and ending with the dry ingredients. Scrape down bowl halfway through this process. Just before it looks completely mixed, pull it off the mixer and finish combining by hand with a rubber spatula to avoid over mixing. Pour the cake batter into the prepared pan and smooth out evenly. 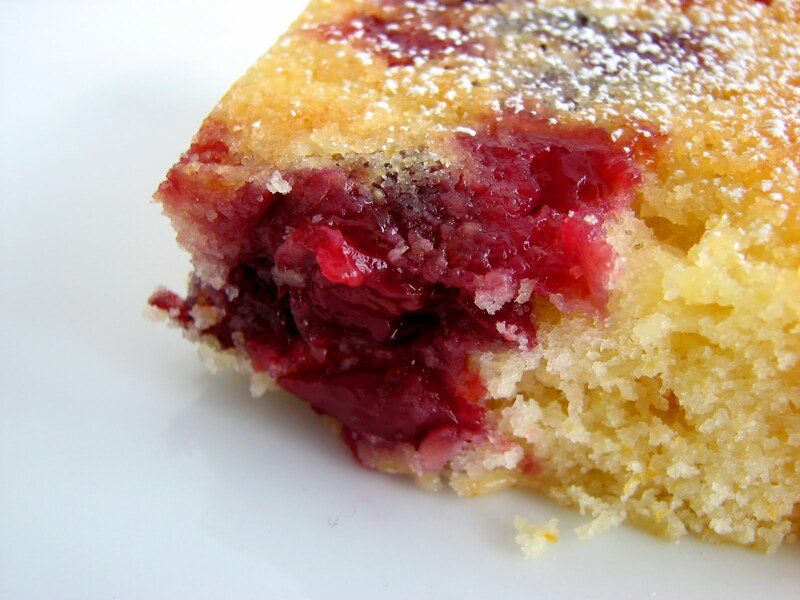 Place teaspoons of cherries every couple of inches over the surface, pushing the fruit down into the cake batter. Set aside the remaining compote for serving. Bake for about 25 to 30 minutes or until it tests done. Cool for 10 minutes. Gently lift the cake out using the parchment overhang. Turn onto platter, remove parchment and let cool completely. 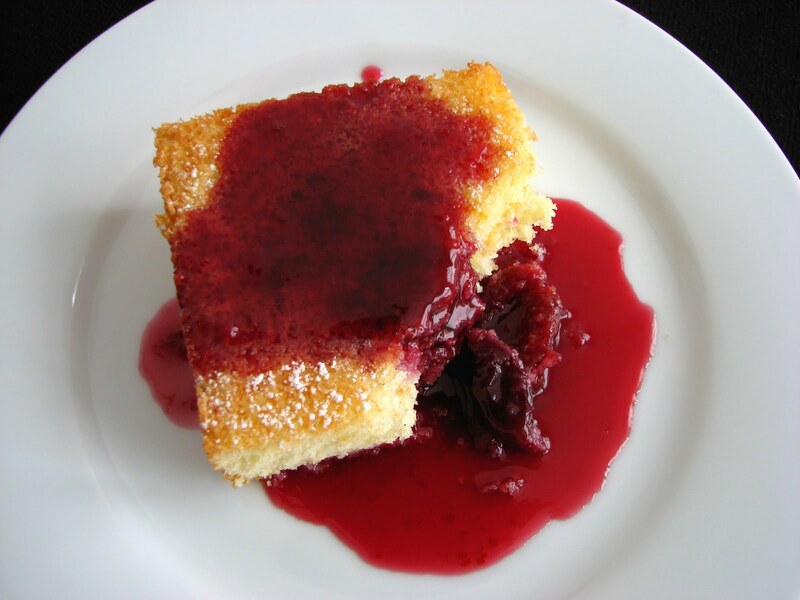 Dust with confectioner’s sugar and serve with cherry compote.